We love a lot of quesadillas in our house! Some kids love grilled cheese, ours love quesadillas… We put cheddar, mozzarella or whatever cheese we have on hand, sliced turkey or chicken or salami… this is our go to on busy, hectic nights. We also love tortillas with our eggs, our homemade crock pot refried beans, and SO much more. I used to buy our stash of tortillas from the store, but that all changed when I saw the 50 or so ingredients listed on the back. Even the ones that are made in-house at our local market had a ton of oils and preservatives in them. So when I saw this recipe for these tortillas, I had to try them. They are a lot of work. But SO worth it. I haven’t even had such quality tortillas at a restaurant. We make ours in a double batch and we make the individual dough balls pretty small so I end up with at least 45 tortillas. We do this 2 Sundays a month! I told you I loved them. I didn’t change a thing to this recipe, other than doubling it. Lisa Leake from 100 Days of Real Food gets all the praise for this beauty. Also, our sweet, sweet friends Gerardo and Zoila Peña brought us a tortilla press back from their trip to Mexico. It is awesome! And it makes these much easier and quicker to make. Ours is very much like this one. 1. Combine flour, oil, and salt in a mixer with the dough hook attached. Beat until well crumbly. This usually takes 3-5 minutes. 2. Gradually add the warm water and continue to mix until the dough is smooth. This usually takes about 3 minutes, and the dough forms a ball. 3. Divide into equal sized pieces. 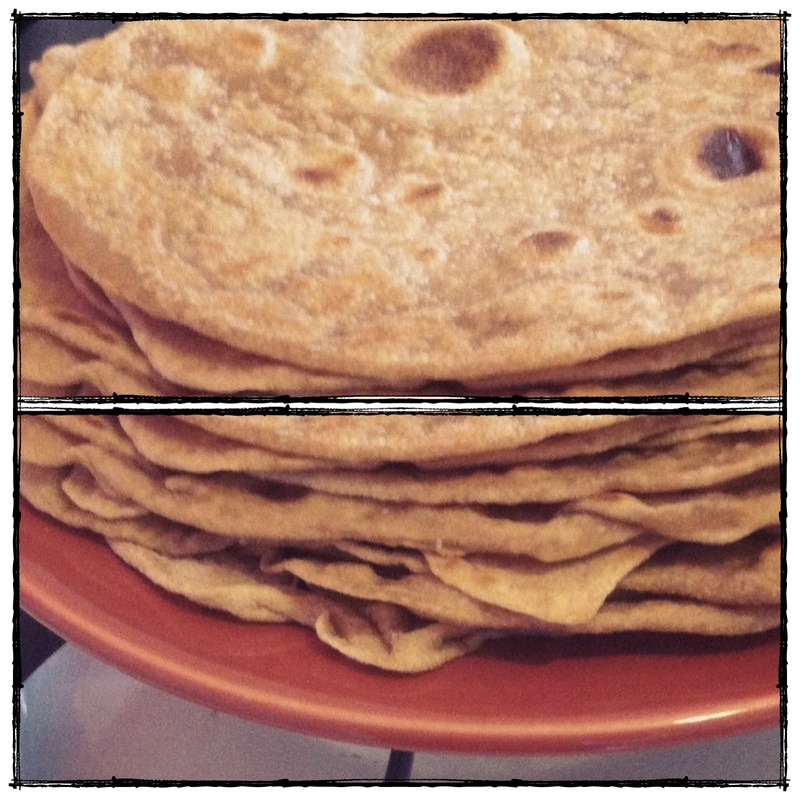 The original recipe specifies 12 tortillas, but I like to make them smaller than that. It is up to you how big or small to make them! 4. Roll each piece into a ball, cover with saran wrap or a dish towel, and allow the dough to rest for 20 or so minutes. 5. Heat your skillet or griddle over medium heat. 6. Flatten each tortilla using a tortilla press (see above), or a rolling-pin (if using a rolling-pin, it helps to roll dough between layers of parchment paper to prevent sticking). 7. Grease the pan with a thin layer of oil (we like to use bacon grease, but coconut oil or ghee would work as well). 8. Cook tortillas one at a time (about 30-45 seconds on each side), until light brown. 9. Allow to cool, and then refrigerate or freeze. They keep just fine in the refrigerator for over a week, or in the freezer for a couple of months. To defrost, just move to the refrigerator a couple of hours before you want to use them! **Recipe taken from 100 Days of Real Food. This entry was posted in Dinner, Kid Favorites, Lunch, Snacks, Vegetarian and tagged evan, whole wheat by Flax + Honey. Bookmark the permalink.